Lately I’ve been dreaming about cooking. Last night, I dreamed I made little chicken and pesto pizzas, the size of dessert plates; this is something I’ve never done. The night before, it was mashed potatoes. I was using a potato ricer, and a whisk. It was so mundane, so plausible. I know how to make mashed potatoes, but I only do it when my husband isn’t around to mash the potatoes. I “don’t know how” to grill meat or mash potatoes. I “will never learn” to grill meat or mash potatoes. A few days before, I dreamed I was making bread, and I watched my hands doing the specific real steps I follow. Methodical. When did my dreams get so boring? I woke each time irritated by such dreams. I often resent cooking. Thoughts about dinner interrupt my afternoon. I feel like a hundred stories have gone unwritten, and ten novels unstarted because I was running to the store for green beans. When we lived in Seattle, I didn’t feel it was necessary to cook every day. There was always pizza to order (and it was good pizza). Or Thai food. Or Indian. Or sushi. Too bad I wasn’t writing much then. The first year in New York, I was way out in North Dreadful, where the pizza we could get delivered was only so-so, and there was nothing else. I got online recipes and learned to make easy new things like Brussels sprouts, and hummus, and rack of lamb, and how to turn Sunday’s roast chicken into Monday’s salad, Tuesdays tacos, Wednesday’s soup. I started writing more. Then the next year we were in the city, where cooking was a rare but important production, with a lot of planning, like a single night run of an off-off Broadway play. I did a whole Thanksgiving with turkey and stuffing and sides in a loft apartment kitchen, and I wrote every day. It was better than a village’s dragon; it was like a quest to face the biggest dragon in the kingdom. I wrote about my mother, who hated cooking and had a limited repertoire of dishes, including creamed chipped beef on English Muffins, and lasagna. I wrote a young person’s novel about a girl in New York, and she ate a lot of take-out, too. As an antidote to the ravages of city living, we rented a house in the country, and while I was supposed to be working on a second draft, I started ragecooking. I’d signed up for a CSA, and found myself chopping a lot of vegetables I did not normally eat and wondering why I’d signed up for a CSA. I mean, kohlrabi? Turnips? Kale and more kale? I celebrated my annoyance with the hashtag #ragecook. I cussed and took pictures and tweeted. People liked the #ragecook tweets better than my normal tweets. Especially when something burned, or was nasty, like an ostrich egg. Ragecooking means that the lentils that turned to mush have immediate value. I can lose it washing sandy leeks or peeling uncooperative turnips, or scouring burnt tomato sauce off a French enamel pan, tweet about it, and move on. I am probably a better cook now than I was before I moved. I am still disappointed when the mushroom soup is good but not amazing, or the bread is crusty but still better toasted. Writing remains hard, especially revising. I think I need writing appointment with the gravity of dinnertime. At this time every day, I will sit down and write. Just like dinnertime. Now we own a house and are unpacking for real. I opened the last box of books a couple of weeks ago, and proved to myself that my collection of cookbooks is gone. It felt like a disaster; I’d been waiting to see them for 4 ½ years, making do with a growing pile of Internet recipes I’d printed out. Maybe I gave the cookbooks away when I was giving books to the Seattle Public Library used book sale. I gave away more than 30 boxes of books. It could have happened. Maybe I meant to give them all away, reasoning that I barely used cookbooks anymore. I was so excited for our great adventure, moving to New York. It could have happened. Maybe the cookbooks are packed in another, mislabeled box, not a book box, but a bigger box, mixed in with the as yet missing fireplace tools and missing speakers and subwoofer. Maybe they were in one of the boxes that disappeared from storage in Connecticut. In the very last box of books I opened, I did find one and only one cookbook, the Joy of Cooking, 7thEdition, which is pretty much not the worst cookbook to have as your one and only. But I was missing my older, original Joy of Cooking, the 6th edition, published in the late 70s; it had a recipes for making aspic and cooking the paw of a bear. It was the cookbook I learned to cook from, and it has gravy splashed on the turkey-roasting page. And I was missing The Silver Palate cookbook, and that Julia Child book, the white one with the red letters, what was it called? How was I to recreate that shelf of cookbooks that got packed up 4 ½ years ago? Which ones did I actually use anyway? Did that matter? 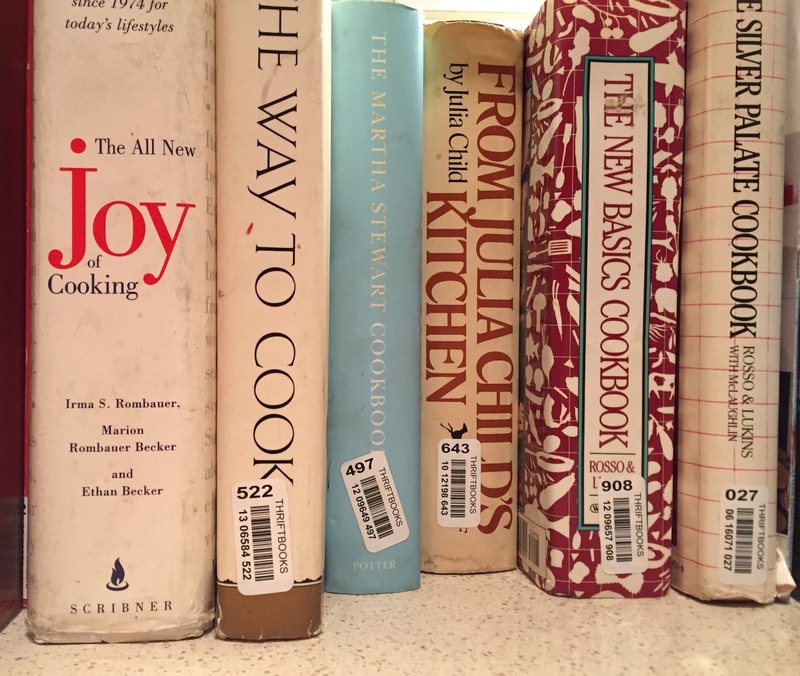 I used Thriftbooks.com to find that Julia Child book, and The Silver Palate, and one or two others, as my memory was tickled. Thriftbooks had some copies of the Joy, but not, it seemed, the edition I was looking for. I wanted the one I learned to cook from. It’s the 6th edition. I got it in the early 80s. It had a recipe for cleaning and preparing the paw of a bear. I will never clean or cook the paw of a bear, but I want that book. I want all the post-its that saved my place. I want the shopping lists and the stains. I want my sarcastic comments about the biscuit recipe in the margins. Somewhere out there is my old Joy of Cooking with the recipe for the bear paw. I can’t get it back. But I can look for the same edition. I went to Ebay. Funny thing about Ebay. I was an early convert to Internet shopping, way back on Amazon in their first years of operation, in the late 90s, where I bought music and hard to find classic children’s books. But I never found a reason to buy anything from Ebay, so I never did. But I was determined to set aside the sadness I was feeling about my missing cookbooks, and found on Ebay what looked like a very decent copy of the 6th edition Joy of Cooking. I babysat my bid. By the end of the day I had the thing, and for less than my maximum. Hooray for winning! A couple of weeks later I had my book, packaged in a nest of broken chunks of styrofoam in a surprisingly long and odd box. The first thing I did was look for the recipe for the bear paw and it was not there. It was the wrong edition after all. Though on Ebay it was clearly marked with the publication date of 1979, the book I bought was the 7th, from 1997. I will pass it along as a gift to my middle child at Xmas, but I’m disappointed. Not exactly angry, just a little sad. My parents' Joy of Cooking is older than I am. The spine is worn out and the book is held together with rubber bands.